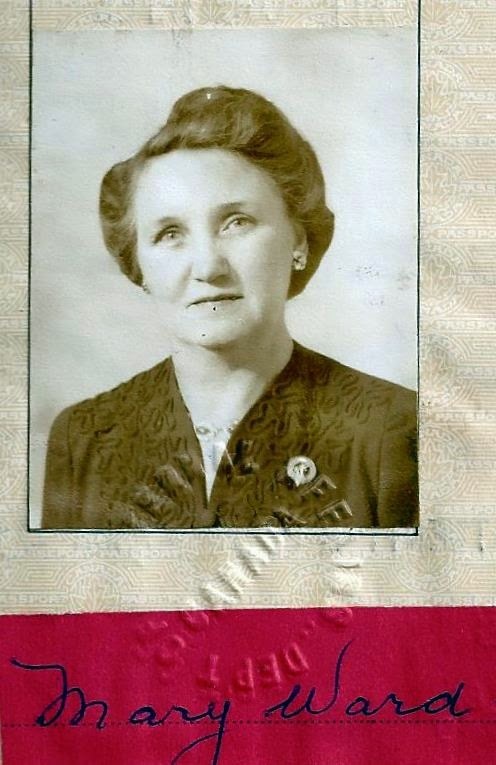 My maternal grandmother. Born Jan 23, 1898, Broxburn or Brockburn, Scotland. 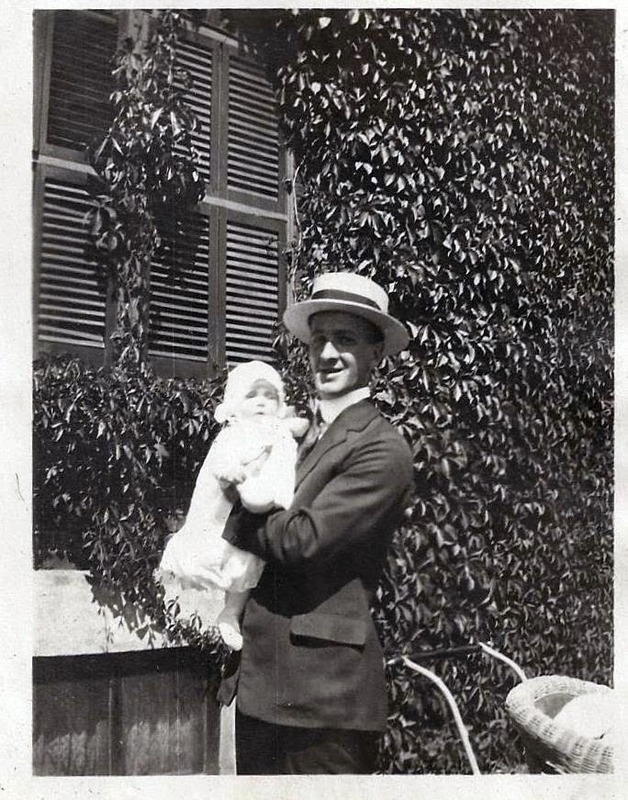 Parents Elizabeth Bell Finnie and William Finnie (oil worker on ships). 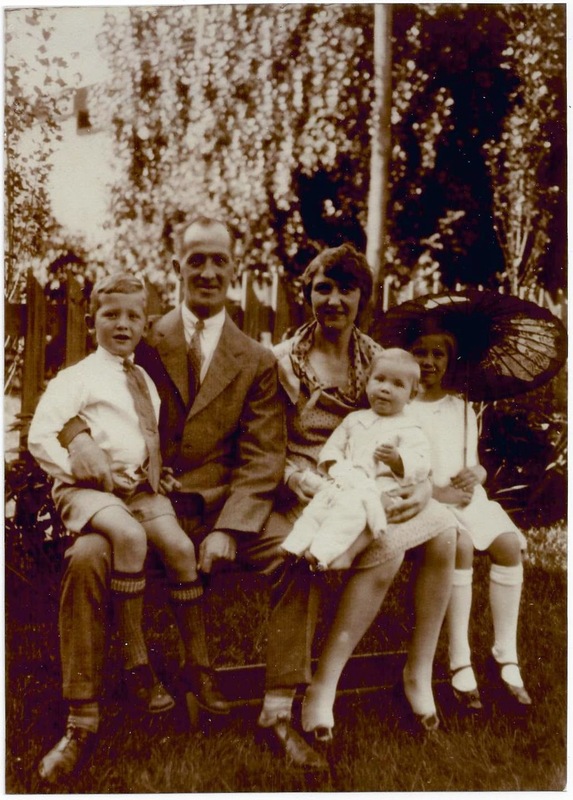 Siblings: George (oldest), Elizabeth, Alex, (Mary) and Bill (youngest). We called her “Nana”. As you can see she was very beautiful. 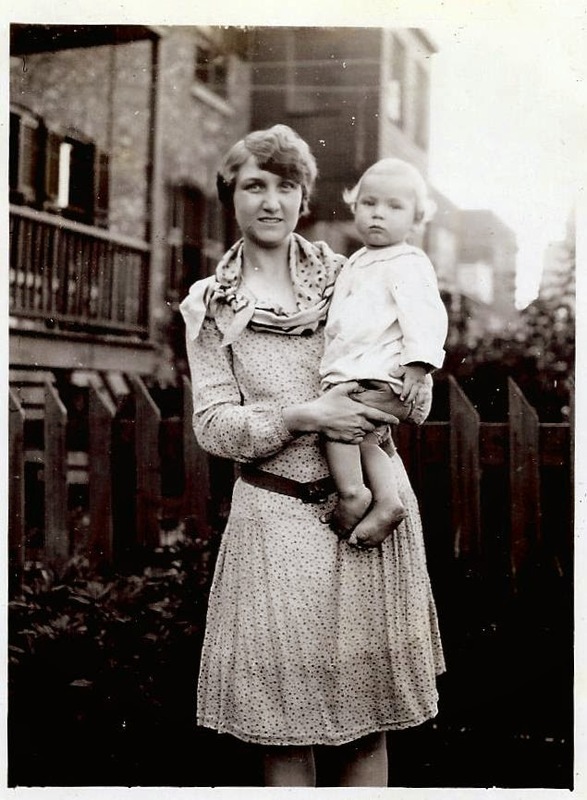 She came to Canada as a child in 1907 or 1908 at the age of 10 and her father died a year or so afterwards. Her mother Elizabeth had to bring up 5 children with no social agency help in those days. Mary’s childhood in Montreal must have been tough. As a result she grew up to be self-reliant and concerned about others. 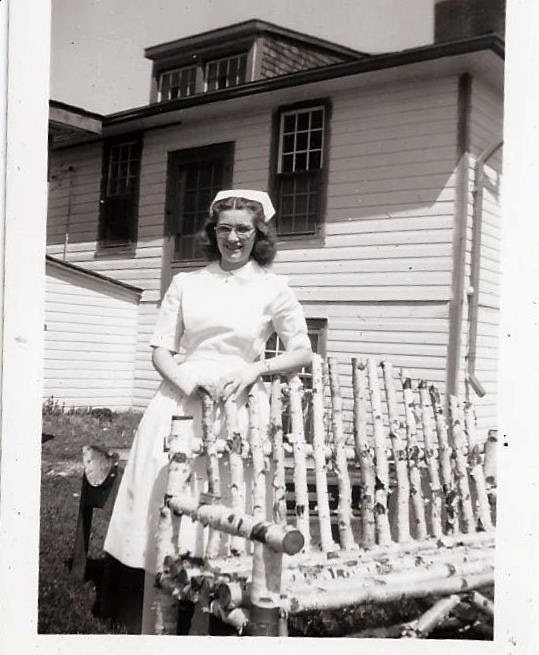 She became a loving wife, a diligent worker for the church and for the Red Cross (she knit constantly) and was a volunteer at the Catherine Booth Hospital a few blocks west of Cavendish Blvd.. This hospital opened in 1925 as a maternity hospital named after the wife if the founder of the Salvation Army. Her Canada Social Insurance No. was 218-260-115. 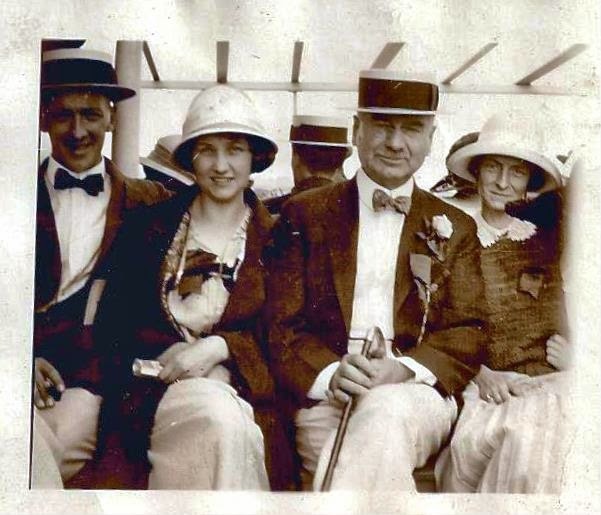 Syd, Mary, Sam (Syd’s brother and and his wife) on an outing circa 1920. 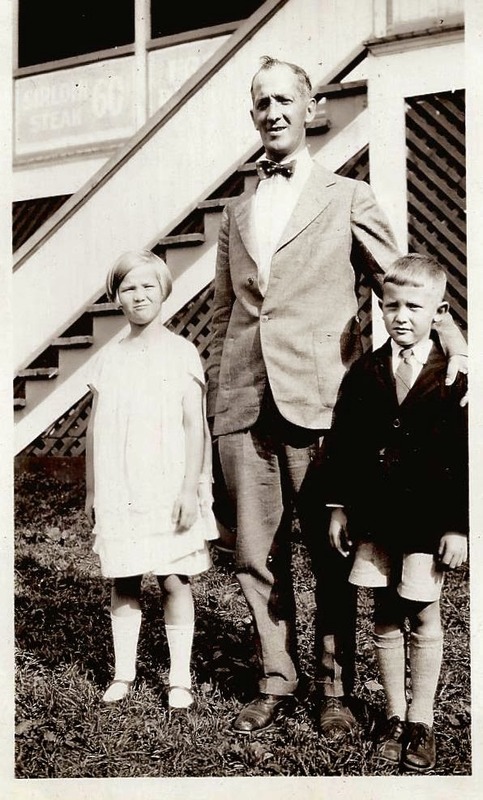 Together with Sydney, 13 years her senior, they had 3 children Mary (my mother)(1921-2011), Charles (C.K. 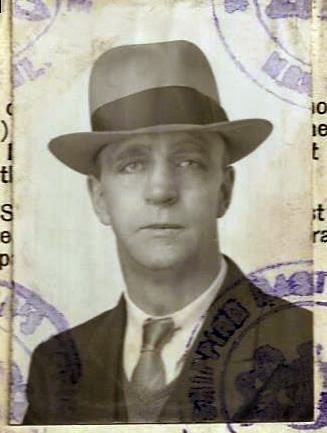 )(1922-1969) and Sydney (Bud) 1927-2008?). It seems that had a good family life. Syd had solid employment and advanced through the ranks at Canada Paint for 52 years. Seems Mary met her husband to be there when she worked as a secretary. As a family they would travel to the Laurentians, Cape Cod and Pine Lodge near Bristol, PQ for summer get aways. She attended Knox Crescent Kensington and First Presbyterian Church, 6225 Godfrey Ave. Montreal. Was active in various church activities. 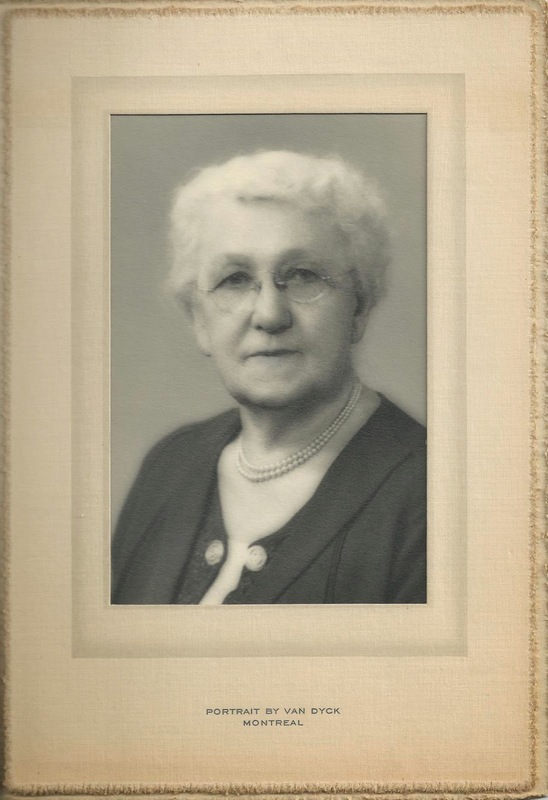 Here is a link to a brief history of this church: http://presbyterianrecord.ca/2011/06/01/knox-crescent-kensington-and-first/ I guess it is safe to say that Mary’s mother Elizabeth was a women of faith and brought Mary into the Presbyterian faith. However it is quite possible her dad William was involved in this too. She was a shrewd investor too or through her husband Syd. 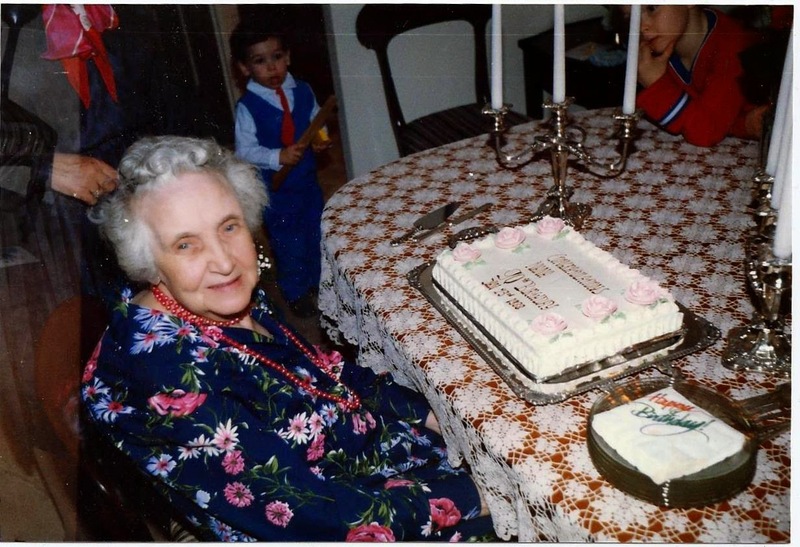 Nana held a slew of blue chip company stock shares upon her death. After Pop dies, she sold the house and moved to 6815 Sherbrooke Street West, apartment 7 and lived there for 20 years. 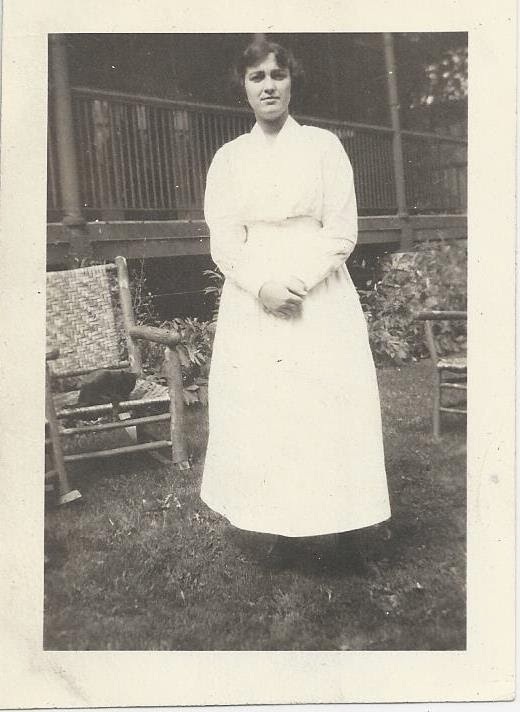 She used to go to Thistle Manor, in Rawdon, PQ for many summer visits with her friend Mrs. Finlayson. 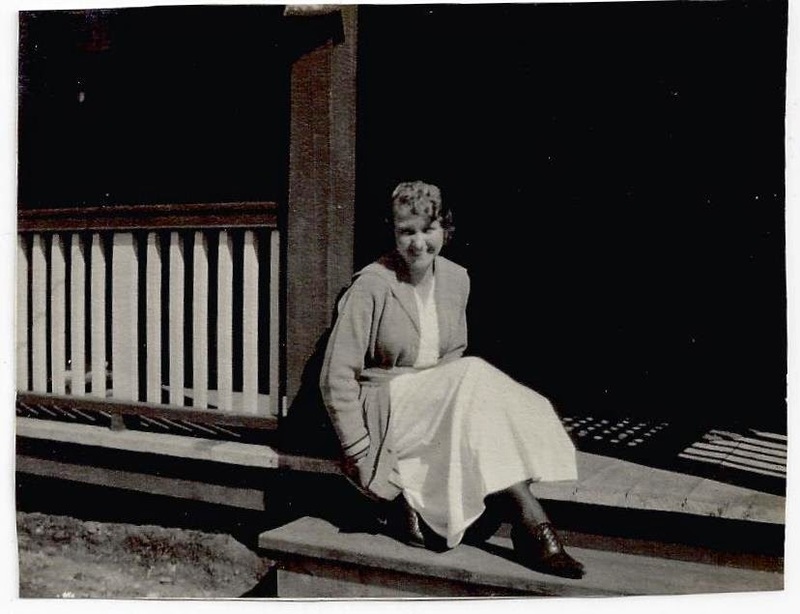 Then she moved to the Griffith-McConnell Residence, 5790 Parkhaven Avenue for about 20 years. Her will of 1969 lists son Sydney Harold Ward (my Uncle Bud) of 9 Steeple Top Road, Roayton (sic), Conn. and Mary Ward now Mrs. A.D. Morgan (mom) as joint executors as well as joint heirs along with C.K. 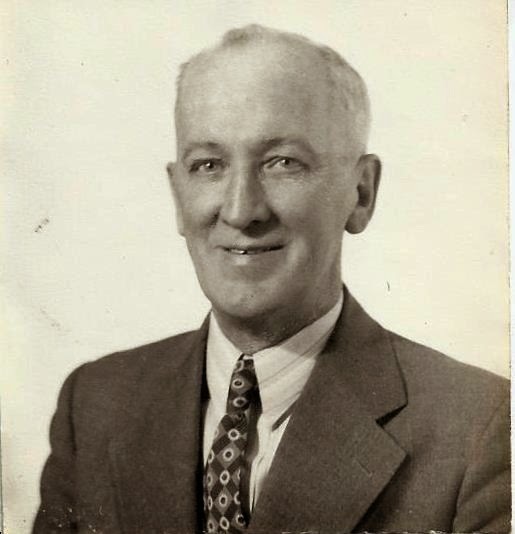 In an earlier will dated 1949, son Charles Kenneth (C.K.) had been designated executor in the event her husband Syd predeceased her. C.K. unfortunately died in a car accident in 1969 which must have left Mary heartbroken. On January 28, 1975 she authorized my mom Mary to be her Power of Attorney. She suffered a series of mini-strokes in the early 80’s. Mom brought her to Ottawa for her last 5 years. We celebrated her 90th birthday here. A week later she took a fall and broke a hip. She survived the surgery but had heart failure on the third day. I was there with mom when she drew her last breath. I remember the interment ceremony. We all went down to Montreal by car. It was a solemn ceremony. Later we went to Ruby Foos for some great Chinese food to lift our spirits. 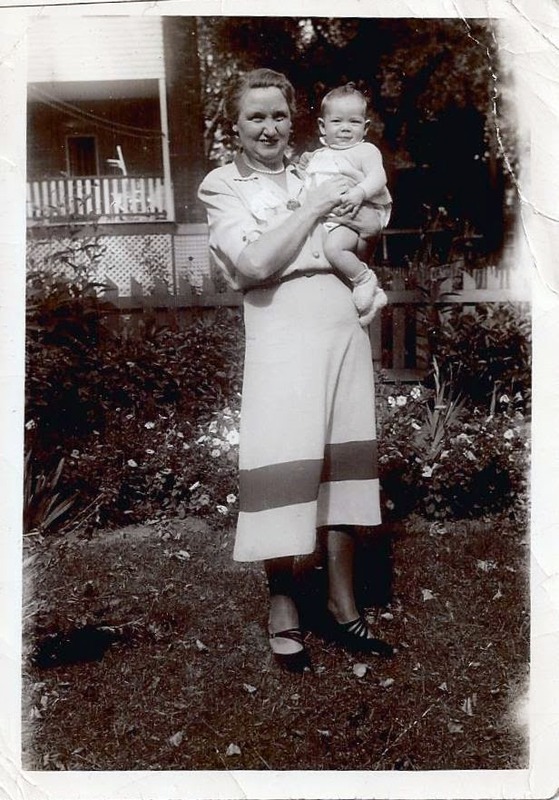 My earliest recollection of her is when I went to visit in the 1950s on Beaconsfield Ave. I locked her out of the house when it was raining and danced around laughing as she tried to get back in. Nasty! Another time I took her mix master apart and that was the end of that machine. 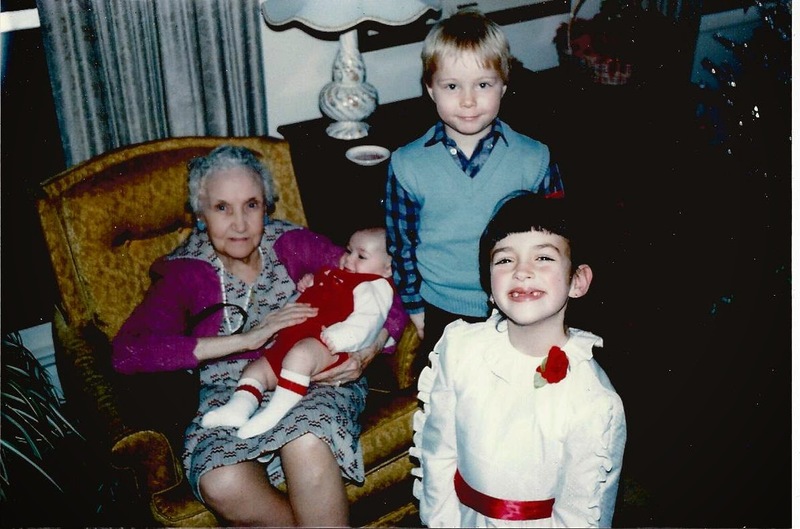 Despite my shenanigans, she was a very loving grandmother to me, always with a twinkle in her eye. I remember visiting her many times on Sherbrooke St. W. I loved the park across the street and playing on the swings. I was fascinated by the pedestrian tunnel under the street. I can still smell the musty smell of her apartment building when you opened the front door after being buzzed in. Her apartment was fascinating to me with all those china dogs. The chime of the clock, that gas stove, the sounds of the traffic, the secret door down the fire escape were all amazing. In 1973 I was working briefly in Montreal. She invited me and 3 of my university buddies for dinner. Well we ate at a card table in the living room. When we finished I remember each of us saying to ourselves that we were still hungry after she had returned to the kitchen. She was so sweet to invite us! My most memorable time was on our way downtown one day in Montreal with her and my Mom. I was about to get out of the car to go exploring and meet them later. As I was getting out she halted me with “David, David! “Yes Nana” I replied. “Old age is for the birds! !” she exclaimed. I thought about this for years and still do. There were many other visits when I would take the bus downtown. I was always fascinated by the way the driver would call out “Hatwaater” when we reached Atwater Ave. Those were the days! 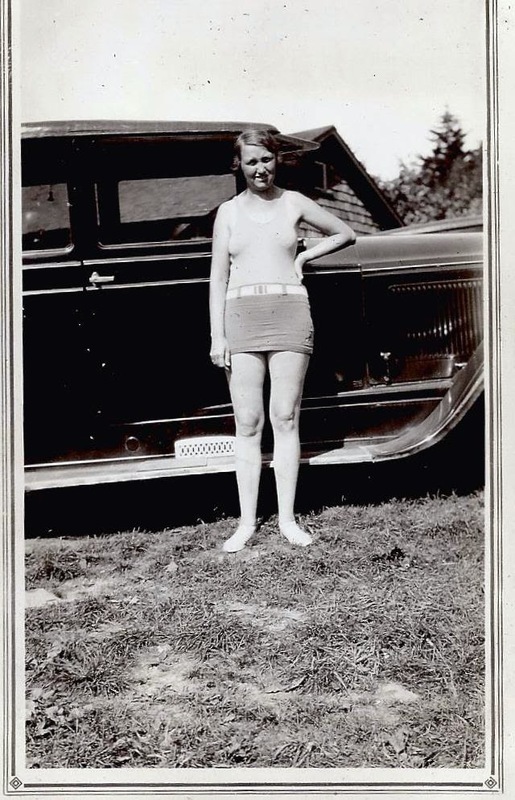 Later mom and I would drive to Montreal to visit her in the Griffith-McConnell home. It was in the middle of Cote St. Luc. In January everyone, I mean everyone would be wearing a fur coat. Very unusual I thought. Although she had a 6 figure estate, one day when we there, she asked Mom if she could still afford the newspaper that was being delivered to her room daily. After she came to Ottawa in about 1978, we saw her often. There was amble time for son Kyle and step-daughter Michelle to get to know her. We have several good photos together. It was indeed a loss to loose her in 1988. 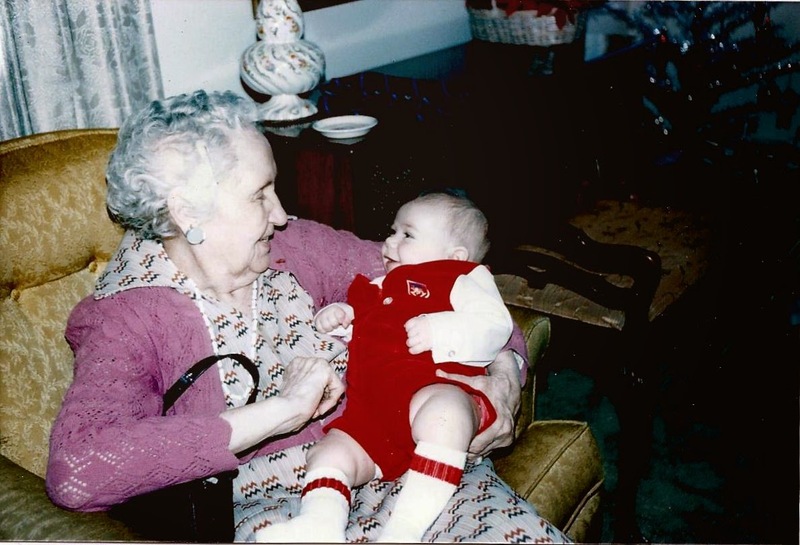 Of all my grandparents, she was the only one I ever spent time with and knew. Thank you Nana for being there for me when I needed you. You are still in all our thoughts and dreams. 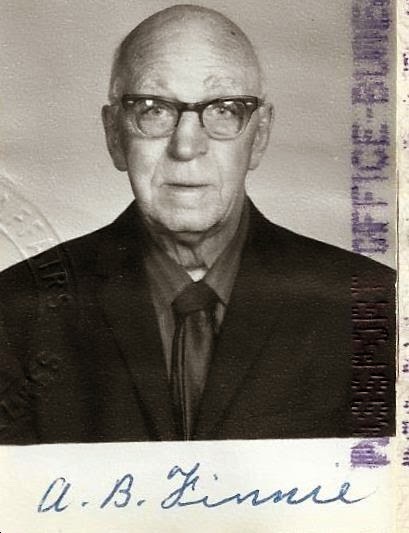 My maternal grandfather. Born Oct 24, 1885 Montreal. (St. Martin’s Church of England Montreal records). Parents Samuel Henderson Ward (died Sept 22, 1938 at age 92) and Jane Frances Hawkins Maxwell from Armagh, Northern Ireland. 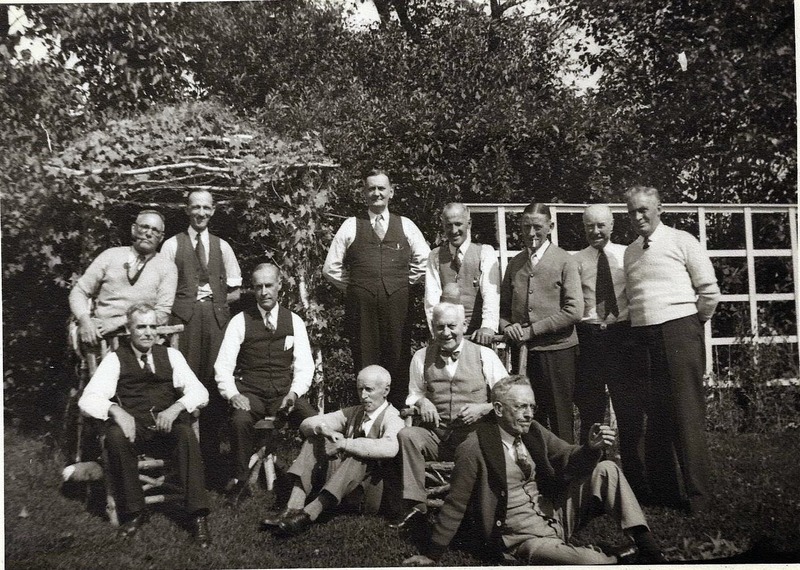 Sydney had five brothers Sam, Charles, Frank, Gordon and Eddie. He had one sister Ann Edith Ward who never married. 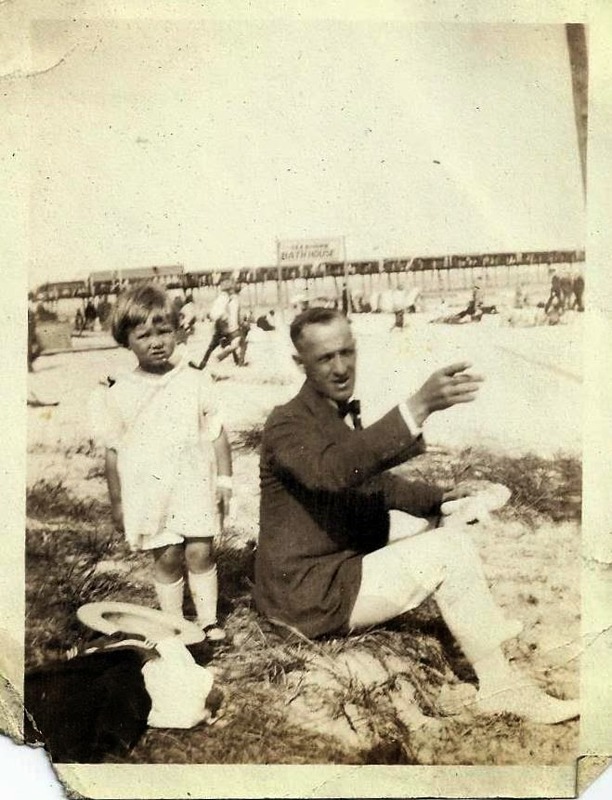 I guess the photos above were taken in about 1920 when Syd was 35 or so. He worked for the Canada Paint Co. for many years. I understand that he met his bride Mary Finnie there who was a secretary perhaps his, starting around 1917-18. They were married shortly after, he being 13 years her senior did very well! He and Mary had three children Mary (1921-2011 my mother), Charles Kenneth (C.K. 1923-1969) and Sydney Harold (Bud 1926-2008??). 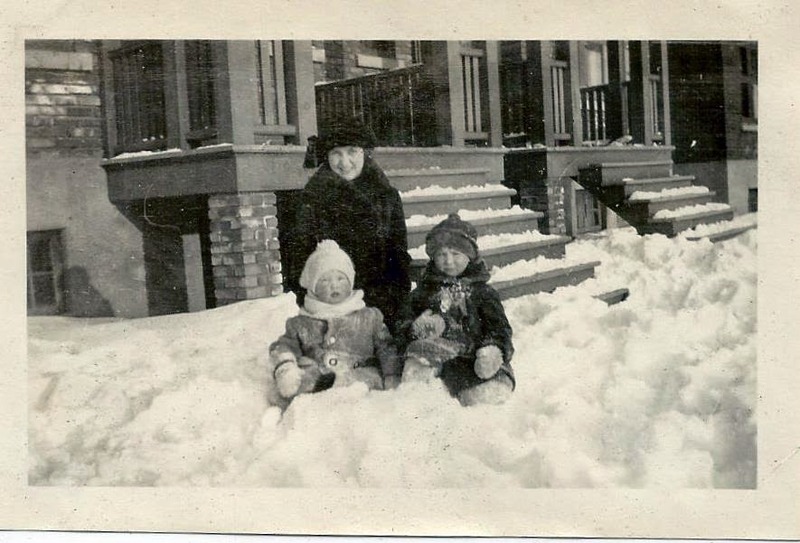 They lived at 57 King Edward Ave in Montreal for a number of years. He purchased 3429 (formerly 315) Beaconsfield Avenue in Montreal on April 29, 1929 from a Owen Roberts taking out a mortgage of $6000. 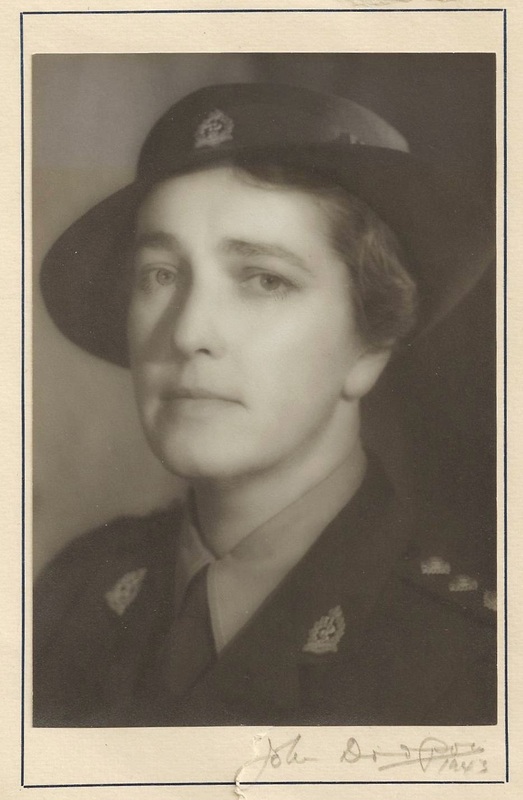 Dame Mary Finnie eventually sells the 3429 Beaconsfield property for $15,500 to Miss Agnes Stock on March 23, 1955. He was a shrewd investor. I found shares of a dozen penny mining companies and a chemical company in the files which I will check with my stockbroker about. In 1923 he also lists owning 3 vacant lots in Laurentide Park fully paid for. His estate was complicated with several life insurance policies and other blue chip stocks valued at $29k. “Sydney M. Ward joined the Canada Paint Company in October 1902 as office boy. In 1903 he was promoted to Invoice Clerk. Then in 1904 he was made Pricing Clerk. His advancement to the position of Chief Clerk followed in 1905. Then in 1910 a new department was created, the Sales Promotion and Advertising Department, and he was transferred to it. Later in 1912 he was assigned a Sales Territory. Promotion followed quickly and in 1914 Mr. Ward was appointed Trade Sales Manager of the District of Fort William east to Nova Scotia. In 1917, following the death of the General Manager, Mr H.W. Aird, Mr. Ward was requested to take over temporarily until a new appointment was made. 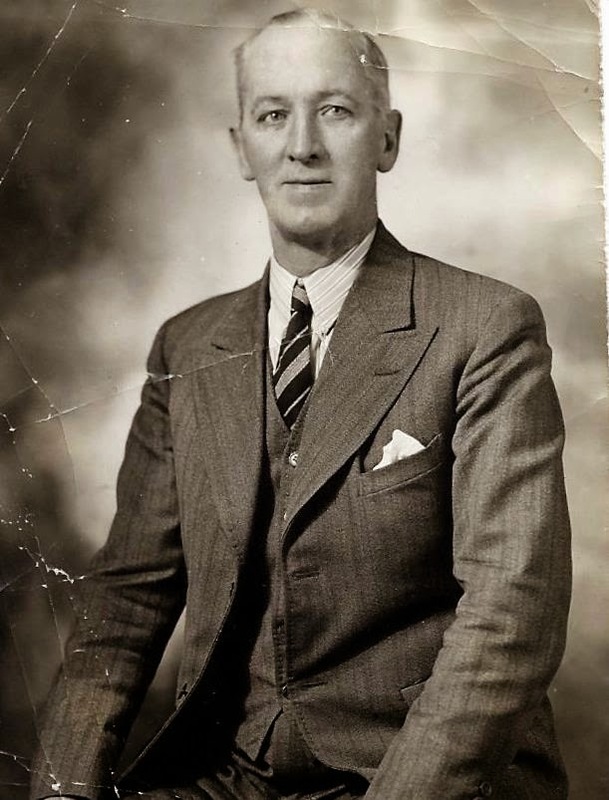 in 1918 when the company decided to enter the export field, Mr. Ward was given the assignment of opening up a new territory which included Bermuda, West Indies, British and Dutch Guiana, which he handled very successfully. 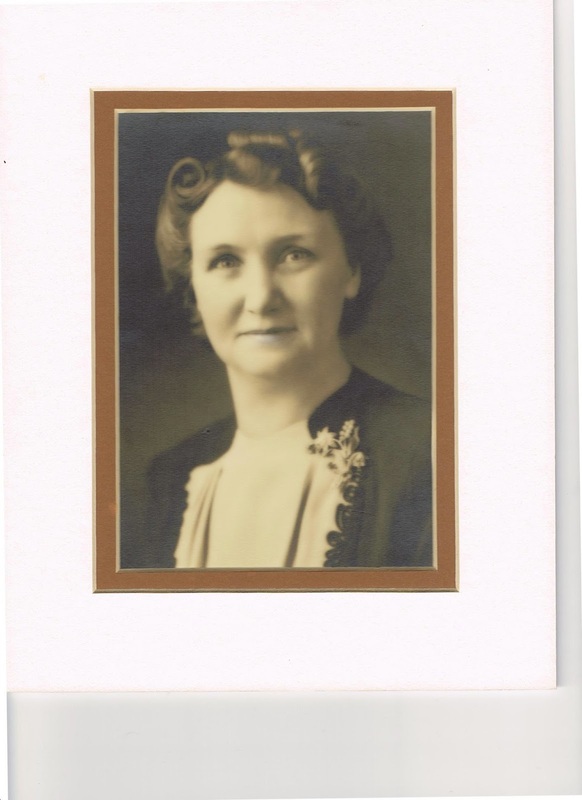 He continued as Sales Manager to District Manager and on the death of our late general manager Mr. J. H. Hawkins, August 1952, Mr Ward was requested to take over temporarily as Acting General Manager.” A bit bizarre because his mom was Jane Frances Hawkins Maxwell Ward. 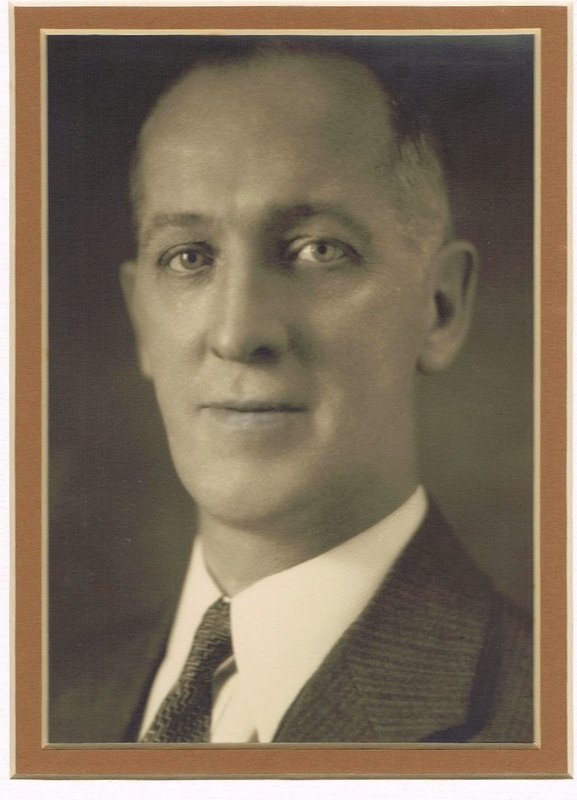 At age 52 he was declared a Life Member of Westmount Masonic Lodge No. 76 on Feb 14, 1938. Hence he must have been a member for at least 30 years prior. Dies at age 69 in September 1954. “A funeral service was held this afternoon in the chapel of Jos. C. Wray and Bro. Mountain Street, for Sydney M. Ward, former district manager of the Canada Paint Compnay Limited, who died at the Montreal General Hospital. He was 69. 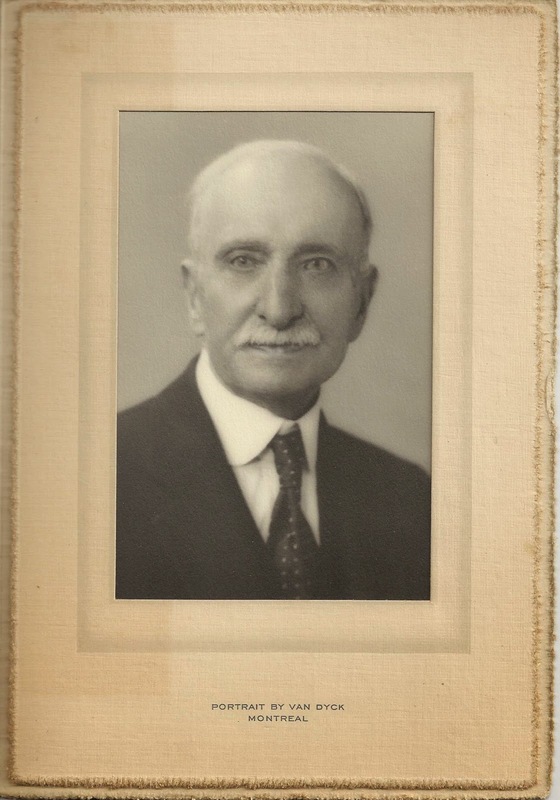 Mr. Ward served 52 years with the company, where he started as office boy in 1902. He advanced through the order department, sales territory and sales management to the post of district manager he held at the time of his death. He is survived by his widow, the former Mary Finnie, a daughter Mary, and two sons Charles and Sydney, a sister and five brothers. Burial will be in Mount Royal Cemetery. There are several letters of tribute from Canada Paint on hand. In one a D.A. Whittaker thanks his widow Mary Ward for all Syd’s dedicated service. He explains that $4,500 in owed salary and commission as well as an additional sympathetic allowance of $3,500 will be paid to the estate shortly. Apparently, as he explains there was no ongoing survivor pension benefit paid in those days. The letter mentions discussing this with C.K. and that C.K. is heading off to Central America. I likely met him when I was 3 years old in 1953. Mom shipped me off to stay with them when Kim was born in 1953. 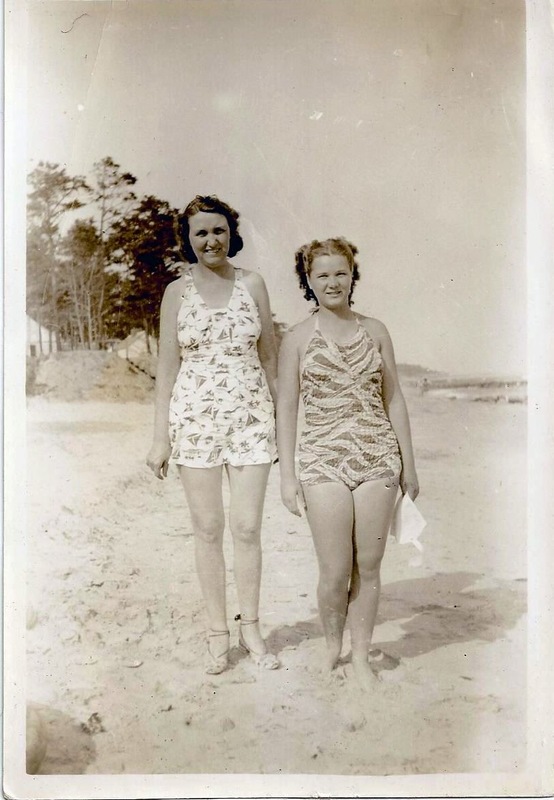 I cannot recall anything other than one standing joke mom would tell. Everyone was heading out the door for an event and no Pop. Mary called out “Pop what are you doing?” A grunt like voice emerged from the bathroom “Oh nothing.” Mom also mentioned that she had been selected to go to London for the Royal Jubilee celebration in the 1930s sometime. Syd overruled and decided to send C.K. her younger brother. Not sure why but Mom was not pleased at the time. Sydney was obviously a very successful man with lot’s of friends, family and business connections. Makes me think we are blessed to be descended from him. His spirit lives on in us for sure. Syd and at least one brother and friends at the lake, note the ties! Same gathering. Perhaps they were all Masons? Flower pot on centre persons head! Mary Finnie’s older brother. My mom’s uncle. We called him Uncle Alex too. What a character! Born July 7, 1894 in Broxburn, Uphall, Scotland. Died Nov 23, 1975, Victoria, B.C., age 81. He did not marry until later in life and had no children we know of. My earliest recollection of him was his gnarled hands making it difficult and perhaps painful for him to shake your hand. He also coughed a lot. Once he stayed over at our house in a spare bed in my bedroom, probably 1961-62. I was kept awake all night by his coughing. He also had a rather loud, raspy and commanding voice. He was very interesting nevertheless and lived in that far off city Halifax. He had difficult times in his life it seems. Starting with his dad William dieing when Alex was 14 or 15 and continuing with bouts of unemployment. Mom told me how Uncle Alex was forced to move in with his sister Mary and brother-in-law Sydney during the depression years. He would head out and pound the payment looking for work every day and return in the evening empty handed – for several years it seems. This must have been very humbling and demoralizing. 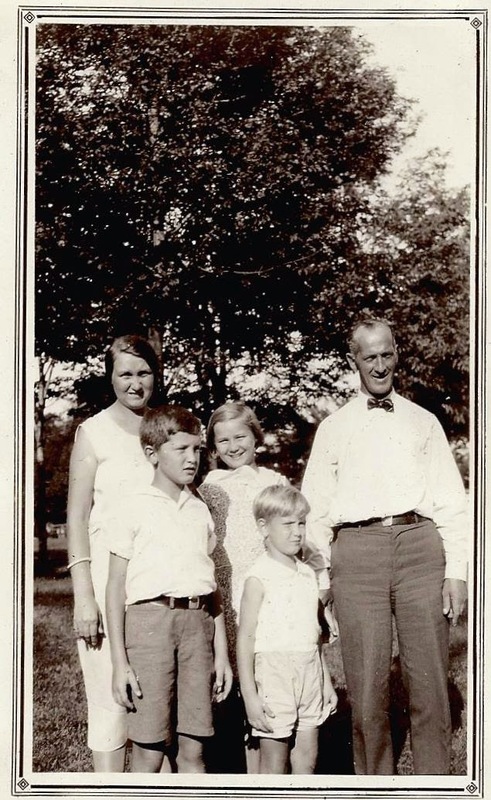 There are also some comments on file in a letter from his brother Bill to Mom saying how Alex used to ‘browbeat’ Grandma Finnie (Elizabeth, his mother), his sister Mary, Helen (wife), Elizabeth (sister), Pauline (not sure who this is?) and eventually Mom. ‘Browbeat’ to me means ‘to seek to get his own way.’ He was a forceful yet gentle character. Balancing this trait is a letter from his boss at Gilmore, German and Milne (see below) saying what a great employee he had been and that he would be greatly missed after retiring. I have a copy his Second Class Engineer of a Motor-Driven Ship Certificate No. 521 dated March 29, 1939. (Canada Minister of Transport). I also have his Continuous Certificate of Discharge for Seamen No. 13138 issued by the Canadian Dept. of Marine and Fisheries. In there it says he was born in 1899 (not correct) in Broxburn, Scotland. 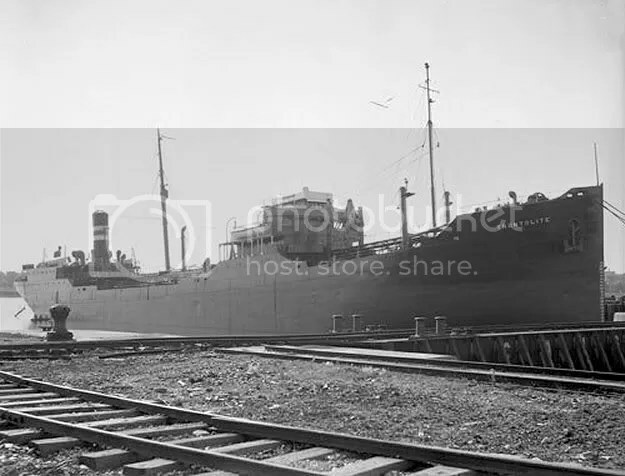 As a Junior Engineer on the International Petroleum Company’s Calgaroble and Trontolite ships between Montreal, Columbia and Peru starting in Sept 1936. In May 1939 he was promoted to 3rd Engineer and then to 2nd Engineer in July 1940. Other ships listed are the Canadolite and the Petrolite. Note these ships were owned by Imperial Oil. The Canadolite was captured by the Germans in 1941 (1 year after Alex was aboard), taken to Bordeaux, FR, converted to a blockade runner called the Sudenteland and eventually sunk by the RAF. The Trontolite survived the war and was sold for scrap in 1946. Presumably these ships were transporting crude oil or fuels from South America to Canada. Each trip to S.A. and back lasted about a month. Staring in 1941 the voyage would be described as “Foreign” or “Home Trade” presumably for security reasons. This booklet lists a total of 33 separate voyages ending Jan 1, 1943. All reports of character were stamped “Very Good”. After the war years he worked until 1961 for Gilmore, German and Milne, Naval Architects and Marine Surveyors in Halifax, NS. A letter on file says they appreciated all his services and he responded that he had really enjoyed working for them. 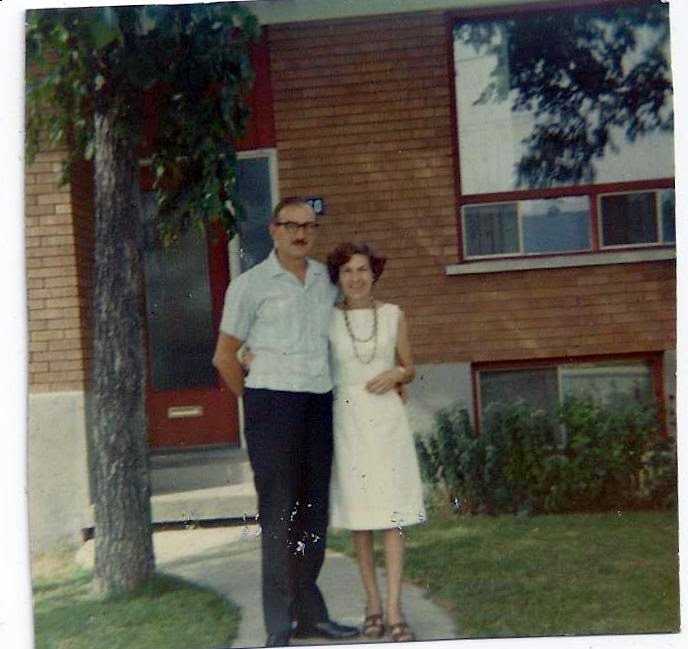 After returning to Montreal to live, he married Helen Gleason Hebert in 1962. Helen had been previously married and widowed. She had been advised strongly not to tie the knot with Alex by the family according to Mom. 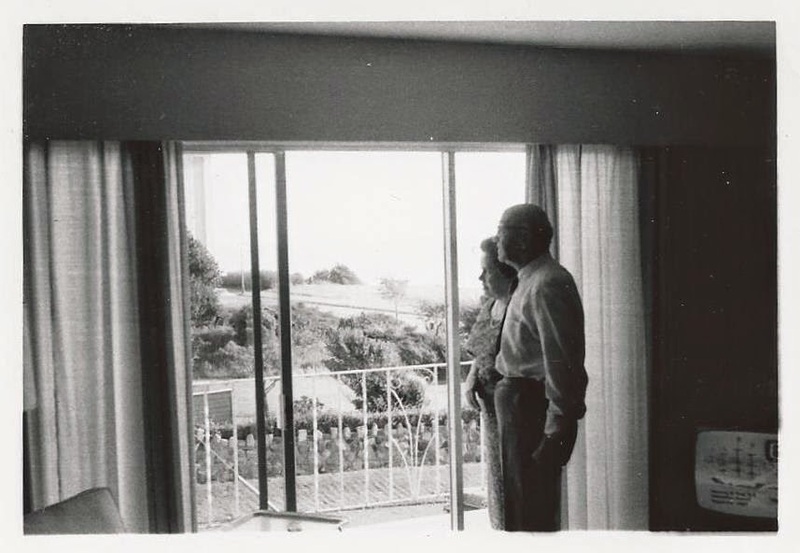 They went on a honeymoon to Los Angeles while younger brother Bill was living there. They moved to Victoria B.C, in 1964. They rented (or owned) a superb apartment on Dallas Road overlooking the Strait of Juan de Fuca with the Olympic Mountains in the distance. He became a member of the James Bay United Church, Victoria, B.C., on Sept 26, 1965. Seems they were very happy. Unfortunately, Helen had a massive stroke and passed away suddenly in 1973. It must have been devastating for him. In a wonderful gentle letter he wrote to Mom in 1974 he thanks her for her letter and gives her some news. He even included a few poems he found in a magazine he liked which are reproduced below. All this was typed up nice and neat. 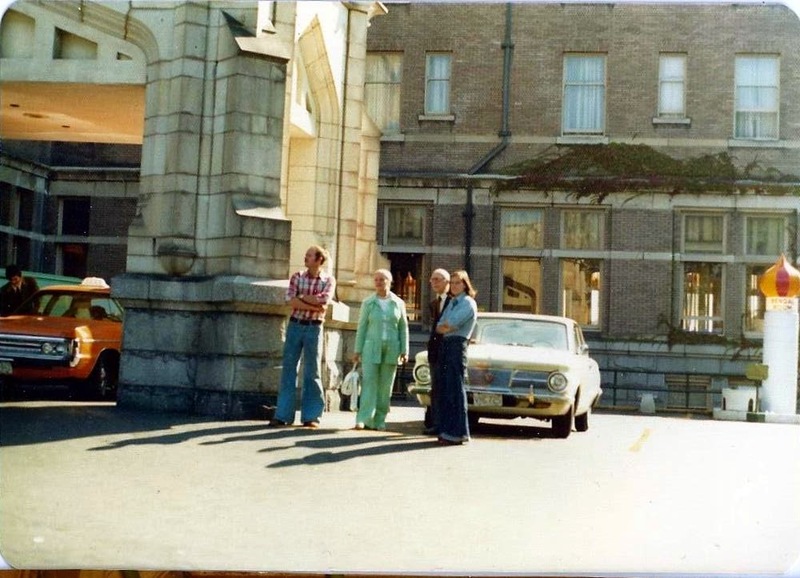 Obituary: Finnie on Nov 23, 1975 at the Victoria General Hospital, Alexander Bell Finnie, a resident of Victoria for 11 years. Predeceased by his wife Helen in 1973, he is survived by one sister, Mary Ward of Montreal; one brother Bill of Nelson, B.C. and several nieces and nephews. He was a member of the Masonic Order. Funeral service in McCall Bros. Chapel, Johnson and Vancouver Streets on Tuesday Nov 25 at 1:30 p.m. with the Rev. R. H. Dobson and the Rev. H. T. Allen officiating. In the lead up to his passing, he asked Mom to come out and help him move into a retirement or nursing home. I was living in Vancouver at the time and came over with my van. We managed to move his things and get him settled but it was a difficult transition for him. He was OK for awhile and would call me up wanting to chat. He soon wanted me (and Mom in Ottawa) to come back and visit him as he was ill. We were not able to come on short notice and he was upset. We learned later that he rewrote his will writing Mom out of it! She did manage to come out before he died and they reconciled. Eventually things were settled and Mom was written back in posthumously. I felt bad about my shortcomings in this, but such is life. I am sure you have some Uncle Alex stories to share. To his credit, most of us remember him and will never forget him. The monument to the end of the Trans Canada Highway is in the park right across the street. Could be Finnies or Wards. If it’s Finnies might be Alex with brothers George and Bill and someone else. If it’s Wards it looks like Sydney, Sam or Charles but who is that old guy in the middle and the guy with the pipe? Elizabeth Bell Finnie (1868-1942) and William Walker Finnie (1864-1909) (oil worker on ships). They were married June 4, 1886 in the Parish of Uphall in Scotland just west of Edinburg. (George McKenzie and Annie Bell witnesses). Siblings: George (oldest), Elizabeth, Alex (see separate posting to come), Mary (see separate posting to come) and Bill (youngest). 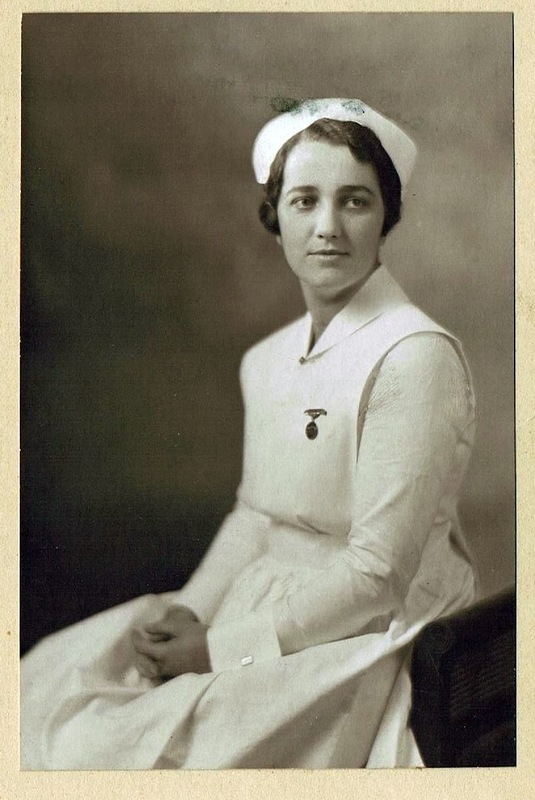 Elizabeth was married to Jim and attended Mary Ward’s wedding to Alfred in 1949. Elizabeth Bell born Jan 4, 1868. Died July 1942. 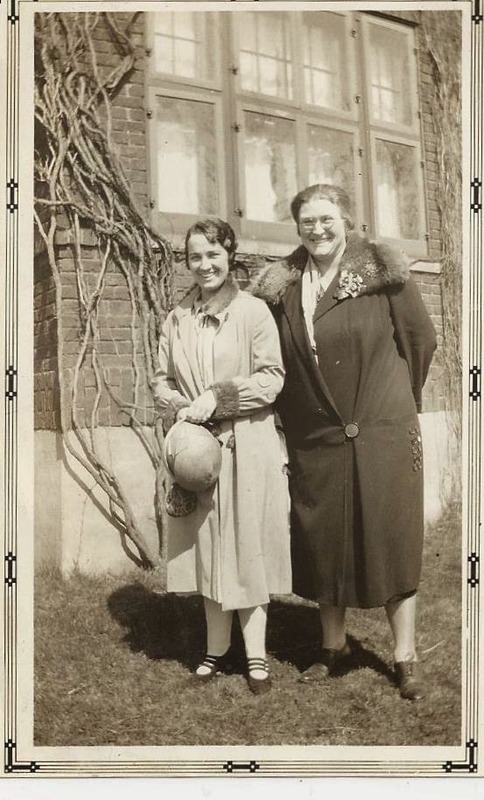 Daughter of Alexander Bell, Retortman (operated a large oven in which coal was baked to produce coal gas) and Elizabeth Thomson at Hall Bathgate in the District of Bathgate, County Linlithgow, Scotland, just a little west of Uphall. Owns Mount Royal Cemetery plot 55F since June 10, 1909. William Walker Finnie born June 8, 1864 at Carnwath, Parish of Carnwath, County Lunwith Scotland, about 20 km south of Uphall. 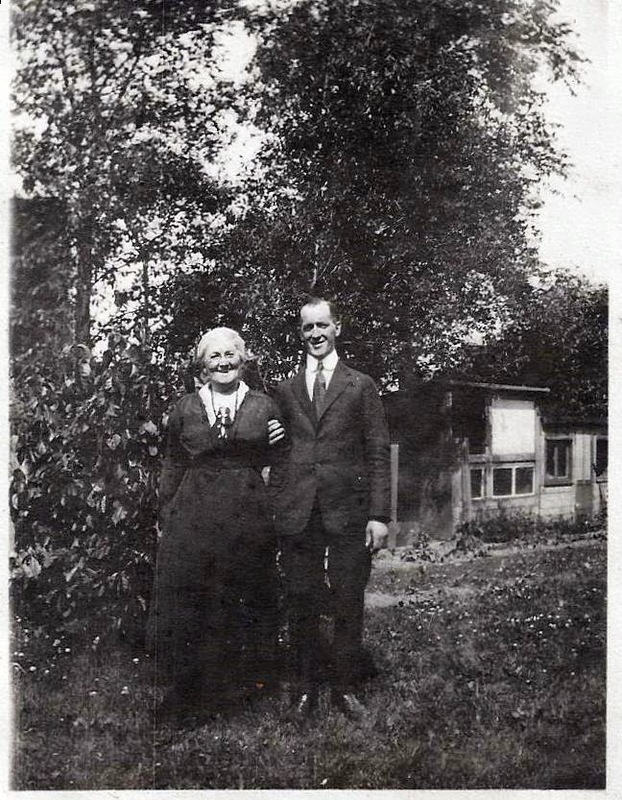 Son of George Finnie, Carter (worked with horse and cart on farms or in towns) and Elizabeth Walker. William came to Canada in 1905/06 by himself. Mom said he got a job at Vickers (but Vickers did not come to Canada until 1911?) and sent money back to the family in Scotland. When George and Alex arrived in Montreal, William was not there to meet them. They had the day mixed up. They took the streetcar to the west end of the line (wrong way) and William was not there. Then they went to the east end of the line. There William was at 2 pm sound asleep on a bench. George and Alex found work for $1/day but had to pay car fair of 10 cents. The three of them saved so that Elizabeth and the three remaining children could come over. When they did, they all moved to Verdun. Sadly, William died one year later of typhoid fever in 1909. The church gave them half a ton of coal to get through that first winter. On file is Certificate no. 4901 from Mount Royal Cemetery Company issued to Elizabeth Finnie nee Bell, stating she had purchased grave No. 55f in Section N. The date is June 10, 1909 and the fee was $17.50. 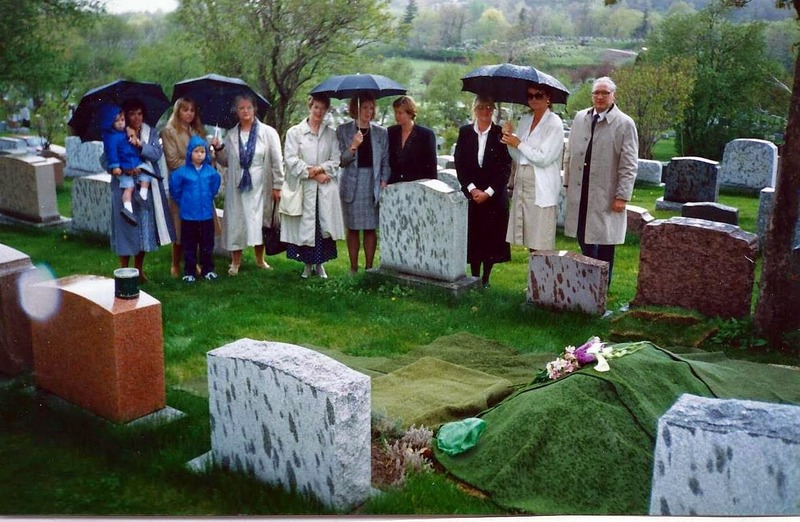 She paid $4.00 as a digging fee for William’s burial. 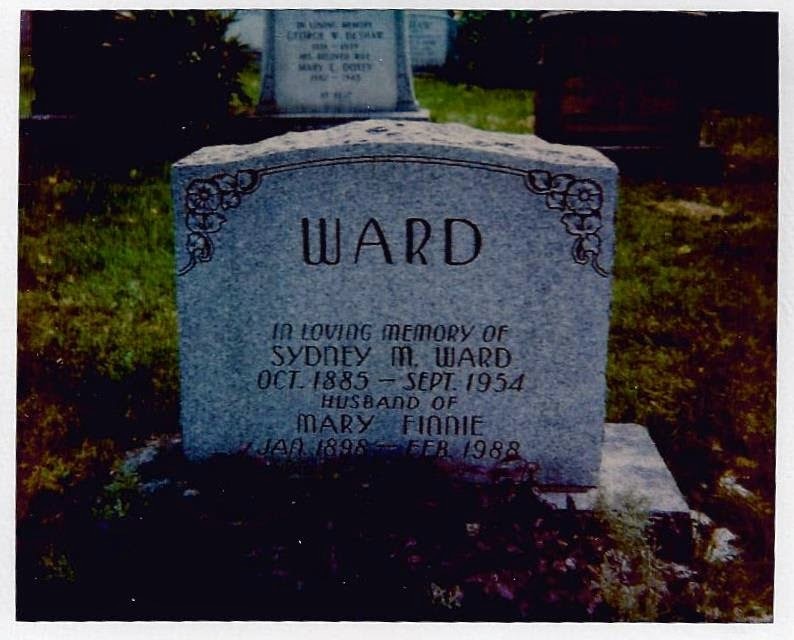 On July 10, 1942, daughter Mary Ward paid $25.00 in burial fees in plot 55-f for her mother Elizabeth. George Finnie apparently married a Roman Catholic woman according to Aunt Joan Ward. One day the Priest came over for a visit and George kicked him down the stairs! He became a builder (we think) and lived out on the lakeshore west of Montreal. 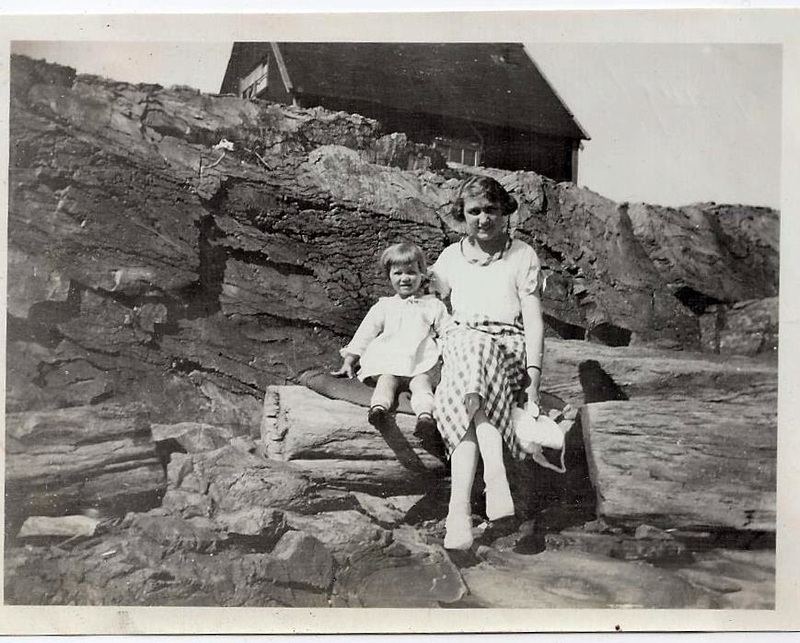 The Finnies were a little mysterious and we only saw them rarely according to Aunt Joan Ward. In a 1974 letter I found to mom from Uncle Alex Finnie, he mentions a Willie Finnie that lived in St. Lambert, QC. This must be a son of George unless another Finnie man also emigrated from Scotland. Willie and his unnamed wife had a son named Gary who in turn had a son born May 2, 1974. Gary was manager of Xerox in Montreal according to Uncle Alex. Nana’s address book has a W. J. Finnie (Bill?) living at 8 Roanoke Road, Don Mills, ON, and at 4 Wonderland Dr, Scarborough, ON (crossed out); A. B Finnie (Alex) living at first 72 Seymour, Halifax (crossed out) and then 636 Dallas Rd. Victoria, B.C. 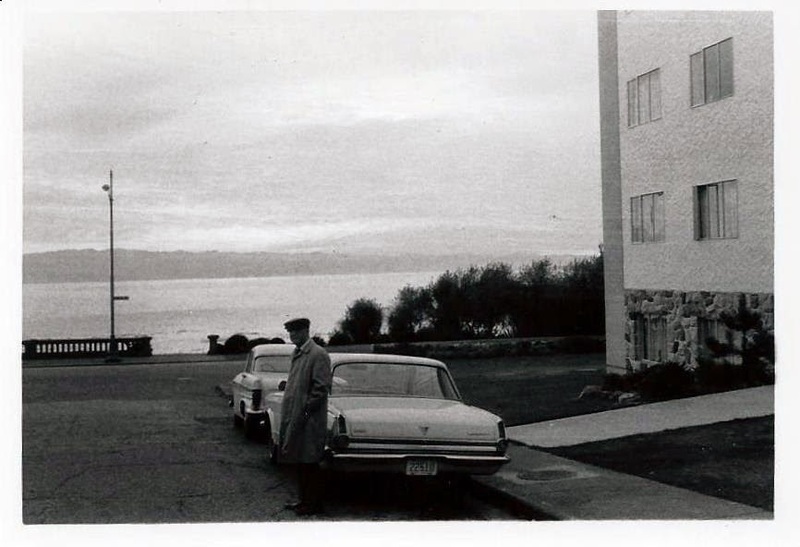 ; Bill Finnie living at 5343 Vincent Ave, then 5433 Mt Helena Ave, LA, CA and finally 711 Elwyn Street, Nelson, B.C. ; and a Jean Finnie at 18 Bell St, Renfrew, Scotland (crossed out). Strange that there is no mention of George. I wonder if they had a falling out?? 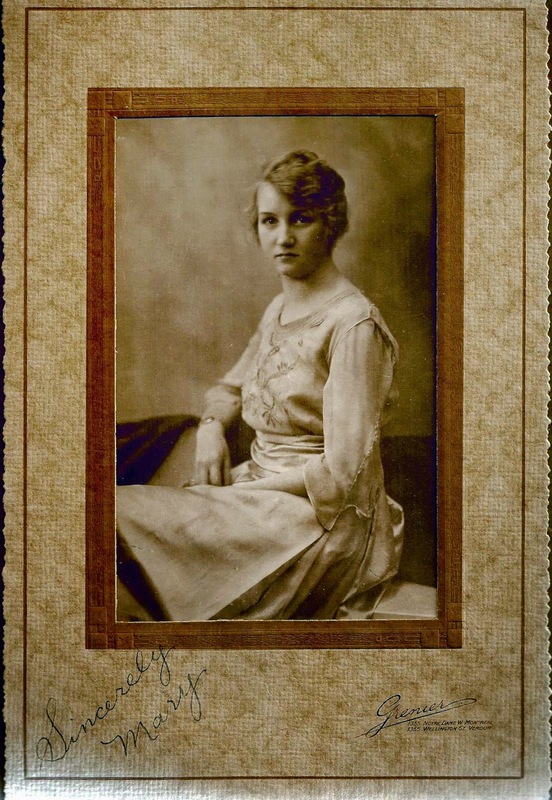 Else it could be Aunt Lizzie the lady below around 1920 when she was 25?? 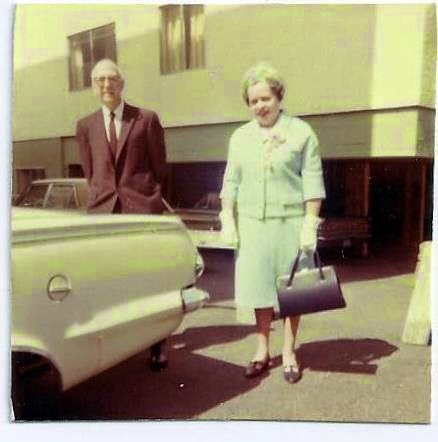 I believe this is Elizabeth Finnie (Aunt Lizzie, Grandma Finnie’s daughter, Nana’s sister) about 1950 judging by the late 1940s style of the cars. She would have been about 55 then. If you have additional photos or can fill in some of the information gaps, let me know. Here is a mystery photo of a school boy that is old. He looks more Finnie than Ward. Hence I am thinking it could be George, Alex or Bill as a boy. 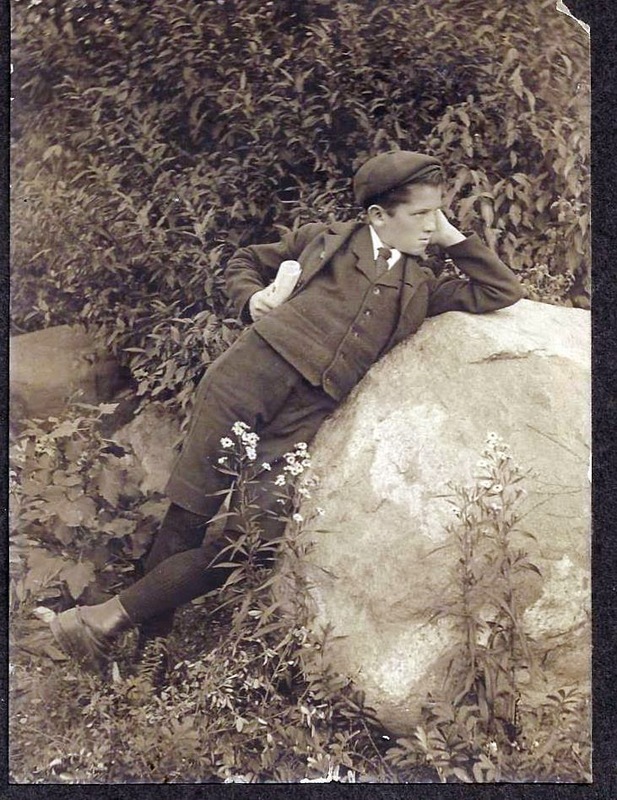 Or, it could be William Finnie as a boy? No inscription but a very old photograph with a pin hole at top, so someone had it on the wall. Could it be Charles (C.K.) 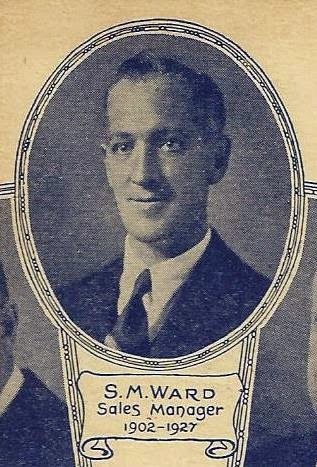 Ward with his school scroll circa 1928-29? 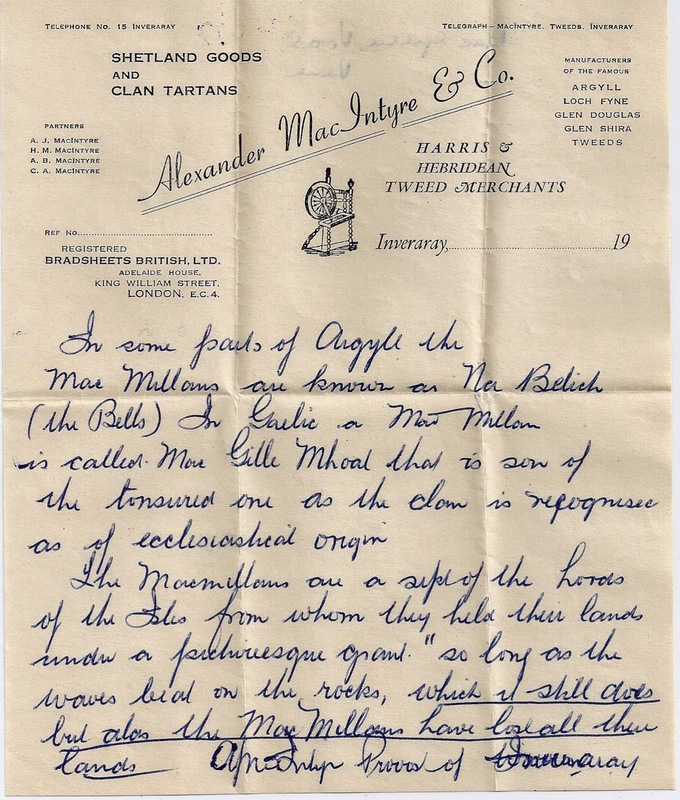 Finally we have an image of the beautiful Clan MacMillan Tartan that Claudia was able to find. Thanks Claudia. Samuel Henderson Ward (1846-1938) (Grandpa Ward) and Jane Frances Hawkins Maxwell (Grandma Ward) (1857-1938) were originally from Armagh, Northern Ireland. 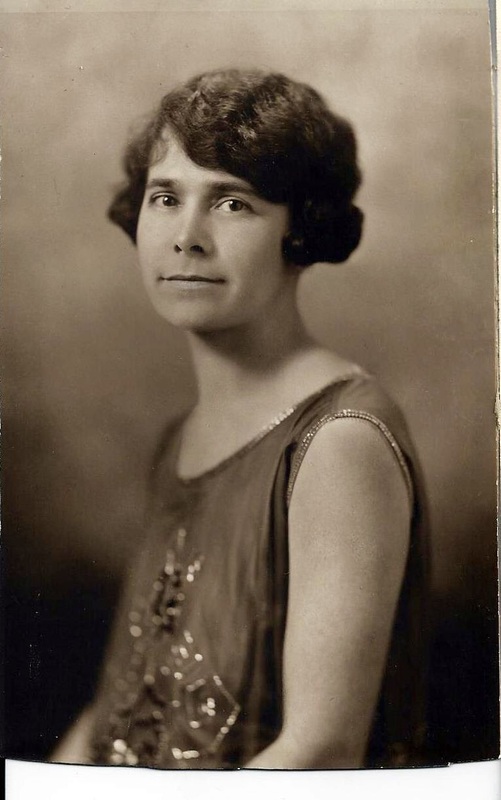 They had six sons and one daughter Ann Edith Ward (1900 – 1970) who never married. 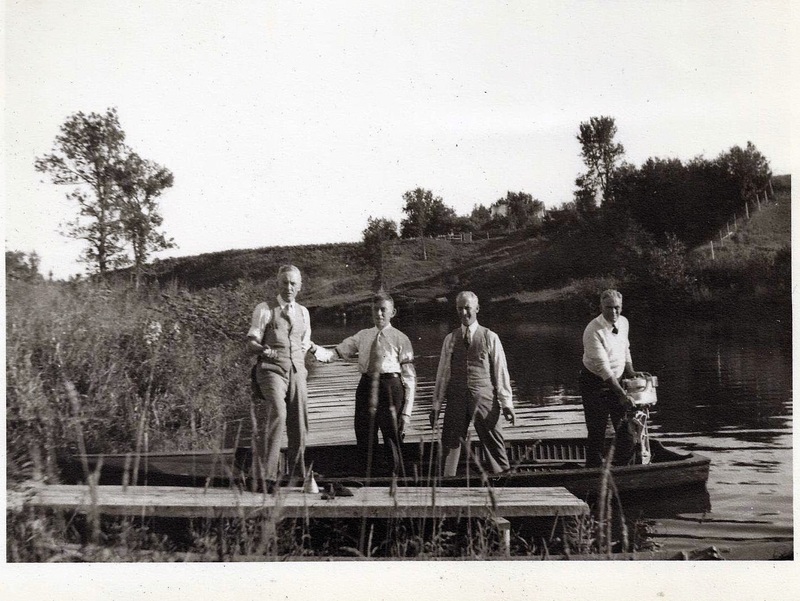 Sons: Sydney (see separate posting to come), Sam, Charles, Frank, Gordon and Edward. All children were apparently born in Montreal. At the time of his death, Sam Henderson Ward lived at 3421 Grand Boulevard, Montreal and is buried at Mount Royal Cemetery plot B590. He died Sept 23, 1938 of bronchial pneumonia, at age 92 years. Jane Frances Hawkins Ward nee Maxwell died on Nov 4, 1938 at age 81 of bronchial pneumonia and is buried at MRC in plot B590. 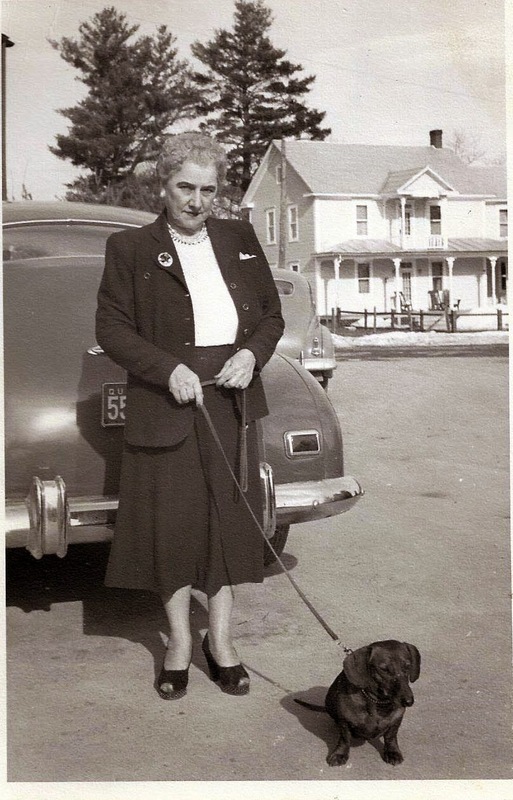 Son Sam was married to Ethel. 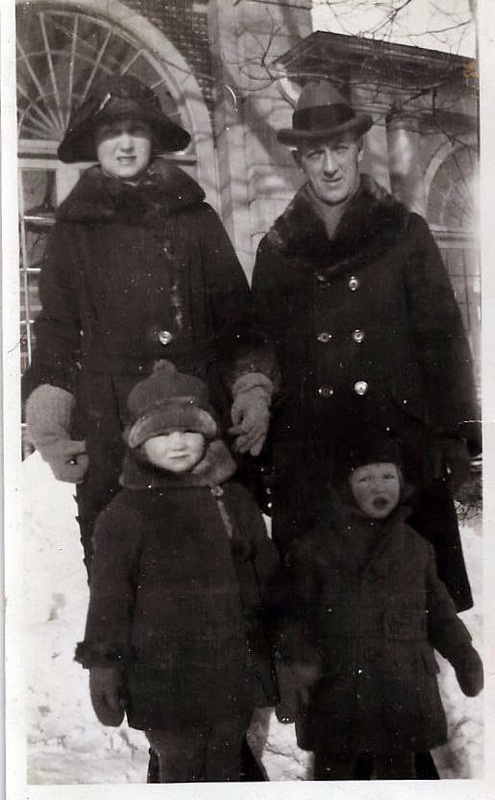 Frank was married to Dora and they had two sons Gilbert and Sydney. At Mary Ward’s 1949 wedding, Aunt Dora is listed as providing a gift with no one accompanying her. Frank also attended and listed a “Florence” as his guest. Hence thay may have divorced or at least separated at sometime. I am not sure when either died. Charles was married to Jessie Pope and died in 1965, she having predeceased him. They had no children it seems. He was the black sheep of the family according to Aunt Joan Ward. (John) Edward Ward (Eddie) was married to Harriet Stewart and had 3 daughters Margaret, Catherine and Sheila (who dies in 1971). Eddie died in 1982. 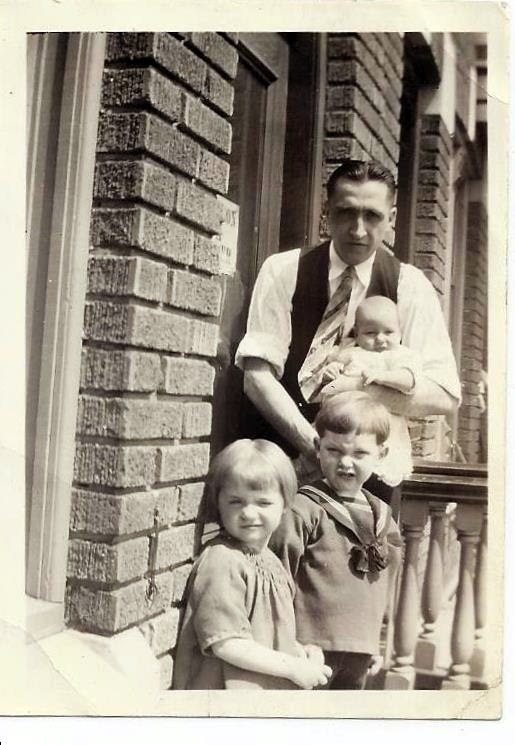 Uncle Gordon Ward (b. Feb 7, 1898) lived at 4725 Borden Avenue, Montreal, then 4315 Melrose Ave and later at 6220 Sherbrooke Street W.. 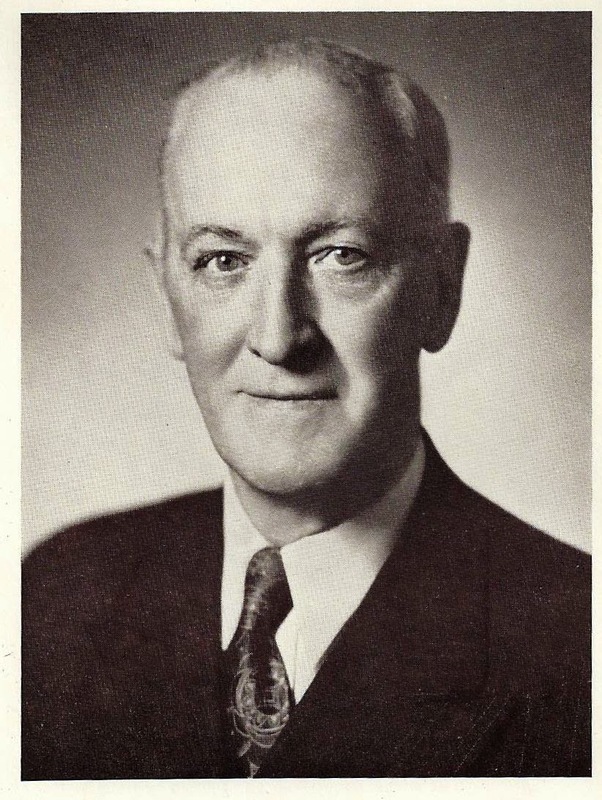 He had his own company (R. G. K. Ward Limited, manufacturers agents). He served in the 1st World War. I have his two medals and a letter from his widow Anne. He was a Mason member of Waverly Lodge No. 82. I have his Mason ring and a Golden Jubilee pin 1908-1958. He was married to Anne Ward but she seemed to be called Dolly. They had a daughter named Heather and a disabled son named Henderson who was a ‘ward’ of my Mom’s. I called him Ward Henderson Ward. Nana’s address book has Frank Ward living at 30 Irene au Claire, Chambly, PQ, (but then crossed out); Syd Ward living at 2 Langevin St. Chambly (Frank’s son), Sam Ward living at 1401 Sherwood Cr, Mt. Royal; Ed Ward living at 7490 Glenwood, Mt. Royal; Henderson Ward (had a mental disability and was the son of Gordon and Anne) P.O. Box 6034, Montreal (but then crossed out); J.E Ward (Eddie) at 26 Heilwood, Clearwater Beach, FL and Edythe Ward at 17 Grenville, Westmount (but then crossed out). Also a George Bell living in Dundas, ON, who would have been a cousin or Uncle. I have a Merry Christmas card from Eddie and Harriet Ward sent to Sydney and Mary dated 1915. I also have a 1968 photo album Eddie took of “Man and His World” in 1968. Eddie must have lived to a ripe old age. 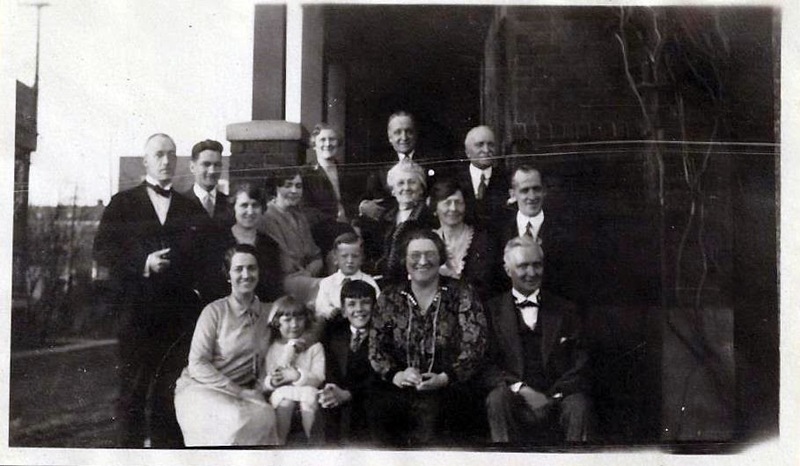 Below is the famous Ward family photo on which this research is based. I would say it was taken in 1924 or so. Just about everyone is in it. However two of Sam`s sons are not married yet: Frank and Gordon (or at least their spouses were not present). Grandpa Ward (Samuel) likely took the picture as he is not in it. I am hoping Aunt Joan can help confirm all this. My best guesses left to right:Eddie, Gordon, Harriet, Mary, young Mary (my mom), Edythe, Jessie, young Charles (CK), Gilbert (or young Sydney)?, Charles, Grandma Ward (Jane), Dora, Ethel, Sam Sr (or Jr)?, Frank and Sydney. 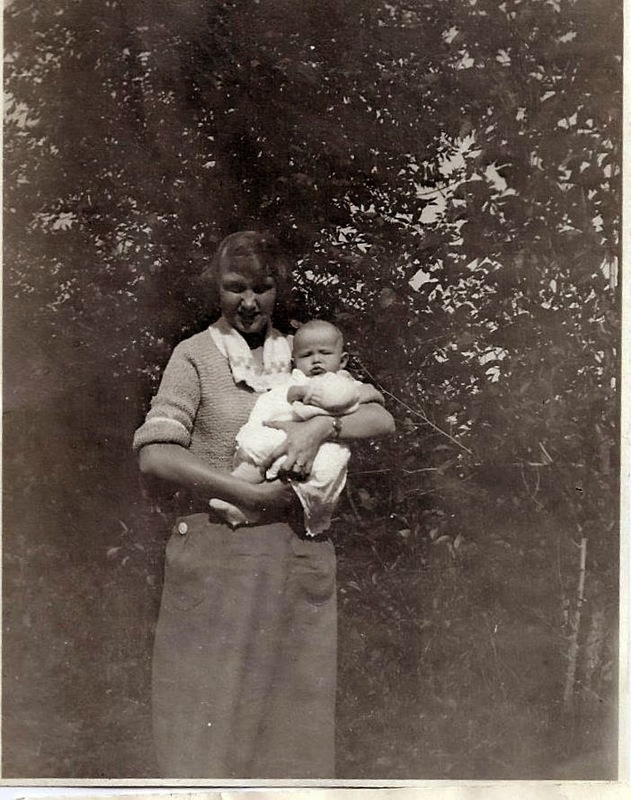 Jane Francis Hawkins Ward with son Sydney. What a beautiful smile. Now to really go back in time. 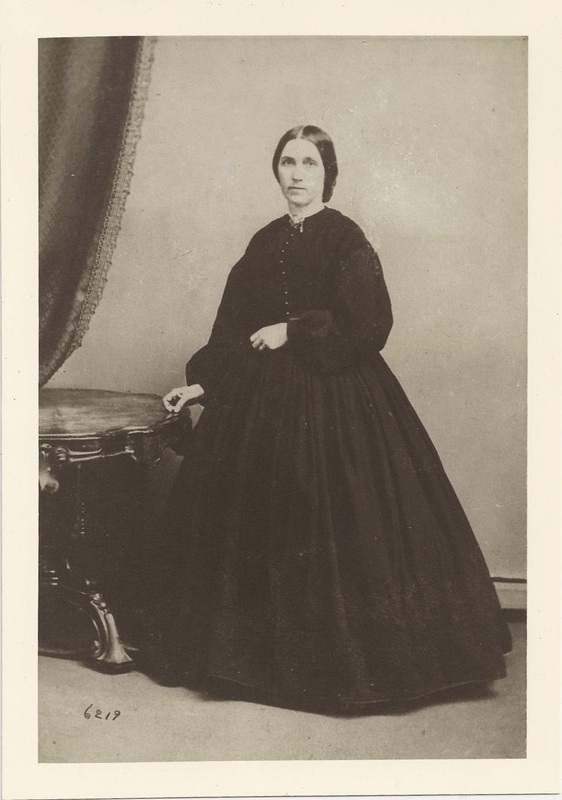 This is a photo of Jane Maxwell’s (Grandma Ward) mother, hence my Great, Great Grandmother in Ireland circa 1866-67 but it could have been earlier. And here is a photo of Jane Frances Hawkins Maxwell as a girl in Ireland. 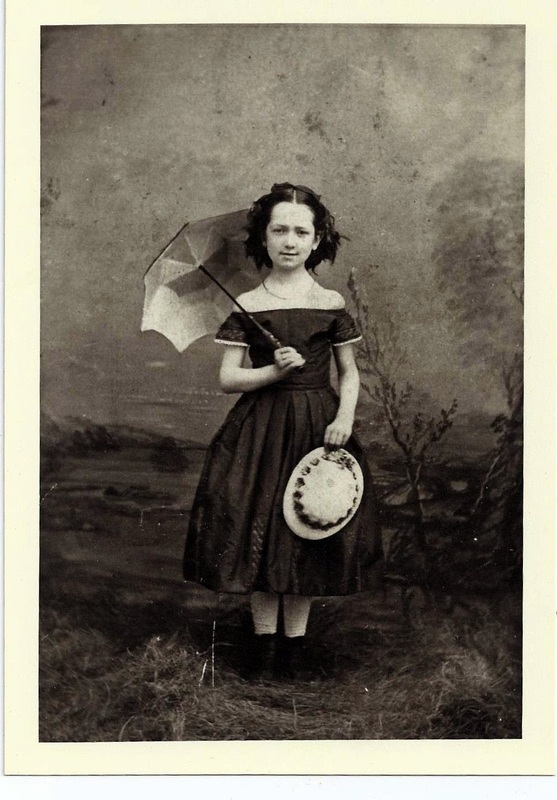 She looks about 9 or 10 so this would be about 1866-67. 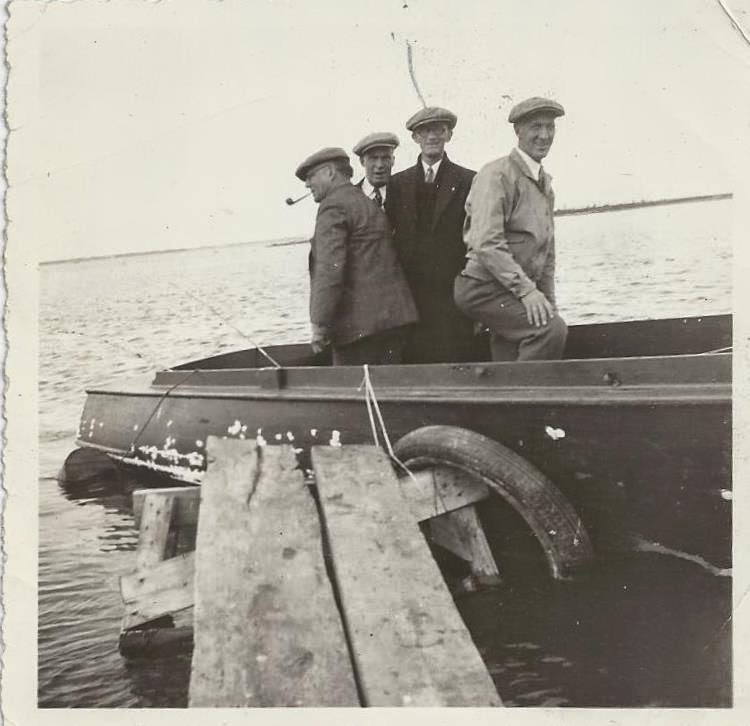 And another mystery photo with no inscription. 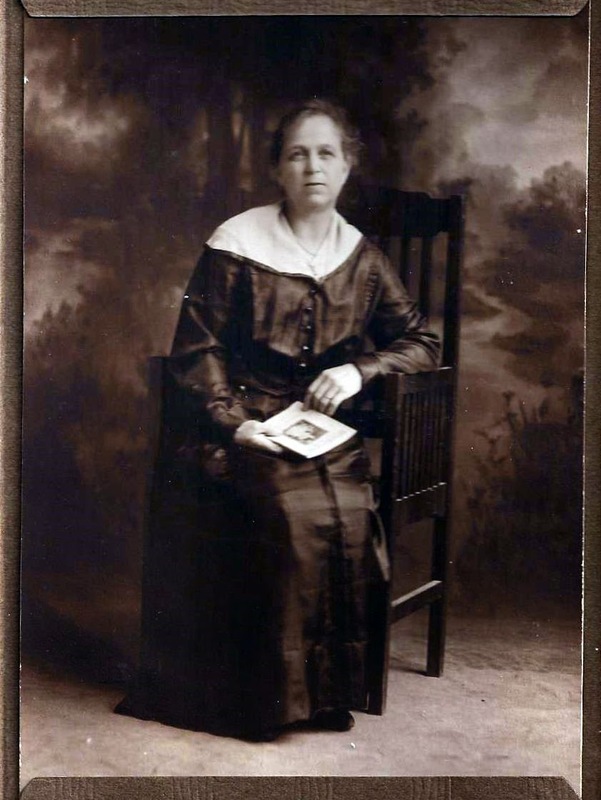 I think it is Jane Frances Hawkins Ward about 1900. She would have been 43 then. Photo taken at a Montreal Studio. In going through my mother’s treasure trove of old files, I have come across some interesting documents, letters and photos. Rather than throw these things out, it occurred to me that I might capture some sketches of some of our deceased family members based on the documents on hand. There are photos (lots), wills, birth certificates, letters, cards, school records etc., etc. Hopefully this will be interesting and of more value than simply creating a family tree. I suppose I will eventually get around to creating a family tree for the Wards and Finnies unless someone has already done it?? Who knows, this information may inspire a present or future family member to continue to add to our story in future? The permanency of the web seems the perfect place of repose for these writings. Of course access to this information will be by invitation only. I encourage your participation and comments. Please feel free to comment or correct anything written here. My hope is not to offend anyone and if so, would you please let me know so I can retract. I plan to publish these sketches sporadically over the next few months. You can subscribe to new postings by email at the bottom. (I hope this works, there may be other ways.) I will be updating each sketch as I go you you can expect updates for something already written.